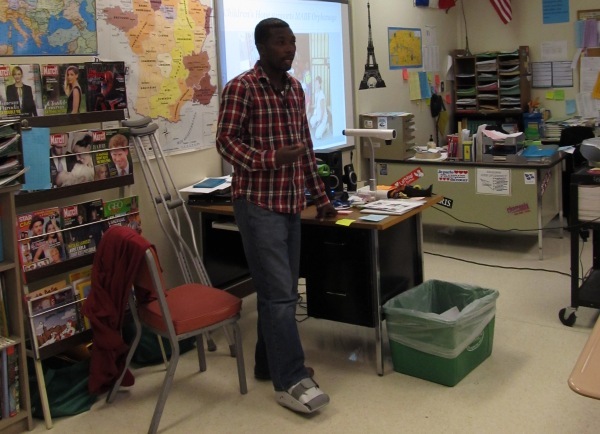 Marco Lisius shows off his broken leg while speaking to French students. the orphanage that he runs in Haiti. After dedicating a large part of his life to helping people, Marco Lisius was the one desperately in need of assistance while visiting West Bend last fall. Lisius is the head of the MABO Orphanage in Haiti. In September, he came to the West Bend High Schools and visited the French classes because he is from Haiti, a French-speaking country. But on September 29, he suffered an injury while playing soccer with West social studies teacher Tony Zappia, who was hosting Lisius at his home. During their pickup game, Lisius kicked the ball at the exact same moment as his opponent, who kicked from the opposite direction. The result was devastating. It appeared that on contact with the ball, Lisius’ leg kept moving while his foot stayed in the same spot. The outcome of the kick was a badly broken tibia. Lisius was rushed to the hospital where he could get treatment for his gruesome injury. Despite the severity of the accident, Lisius was very fortunate he didn’t suffer the broken leg in Haiti. It would have taken days for him to receive treatment for his leg in Haiti. According to Lisius, the medical care is so poor and hospitals so scarce in Haiti that he would have likely lost his leg or even his life if he had such an injury there. Even in his extreme pain, Lisius thanked all the nurses and doctors because he knew how much worse it could be for him in Haiti. When the French classes at East and West heard of his accident, they were eager to help. Christi Fischer, East French teacher, was surprised by the students’ enthusiasm as the classes each started raising money to help Lisius as well as his orphanage. The students collected money for several weeks and managed to raise a total of $1,000. Since education isn’t free in Haiti, most of the money raised was put towards funding the tuition of kids in the MABO Orphanage. The $1,000 was enough to pay for the tuition of three Haitian children. Fischer was thrilled at the amount of money the students raised for the poor children in the orphanage. “Education is the way out of poverty,” said Fischer. Lisius, age 37, runs the MABO Orphanage with his brother and sister. He was inspired to start the orphanage seven years ago when he was constantly walking past homeless children in the street. He felt the need to be part of the solution. Lisius doesn’t receive a salary from his orphanage, and the orphanage is financed by donations. The search for donations is what brought him to America. Lisius came to Advent Lutheran Church in Cedarburg as part of a partnership program between the church and the orphanage in Haiti. He visited area churches and schools in an effort to gather donations for his orphanage. Lisius is still making a full recovery and is returning to Haiti on December 4. He came back to the high schools on November 20, sporting a boot and crutches. He was still a very happy, energetic person who spoke to all of the French classes. “He’s just one of those people who makes you feel good,” said Zappia. Lisius said that he has been enjoying his stay in America despite his incident, and he hopes to return someday.